Windows on ARM really hopes to expose Windows to some "awesome" hardware. So great in fact that you'll probably have to buy one yourself if you want one to use at work; A time will come where you'll want to get your work email and maybe even an app or two. You might already realize that by adding an ActiveSync email account to your tablet opens your new device up to restrictions by your system administrator -- like requiring a lock screen password or the ability to remotely wipe it – and in the Windows x86 world, your company uses things like an Active Directory (AD) Domain and its Group Policies to lock things down. But, AD isn't an option for Windows RT. 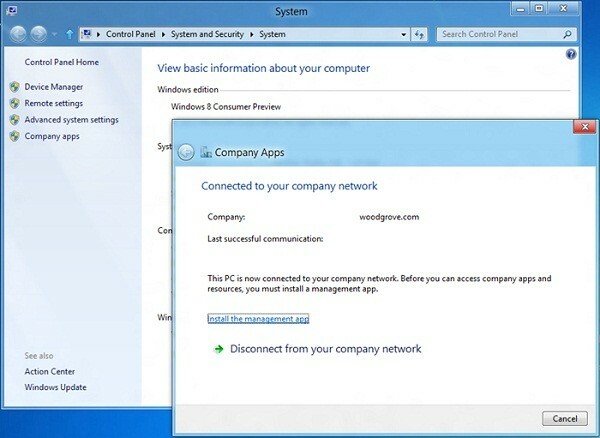 According to the Building Windows 8 blog, Microsoft has instead built in the ability to connect to the company network to access apps, while at the same time, gives the admin the ability to control all the familiar AD security settings like bad password attempts, complexity requirements and can even verify your anti-malware software status. And if you want to disconnect, you can. If you leave the company or just want to use your tablet without entering a password, you can always break the tie and regain control of the security.